Friday, 3/1: MIT, Cambridge, MA, room E62-250 at noon. Monday, 3/4: I'll be a guest on the Leonard Lopate show in New York on WNYC, 93.9 FM, at 1 pm. Wednesday, 3/6: Tattered Cover Books (2526 East Colfax Ave.) in Denver at 7:30 pm. Saturday, 3/9: Writers with Drinks at the Make-Out Room (3225 22nd St.) in San Francisco at 9 pm. Admission $5-$10. 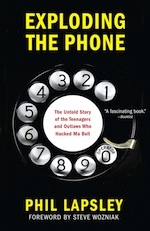 The complete book tour schedule is at http://explodingthephone.com/tour.php. Hope to see you at one of the above events! Tuesday, 2/19: Powell's Books, Portland (1005 West Burnside) at 7:30 pm. Monday, 2/25: Book Passage in San Francisco (Ferry Building) at 6:00 pm. Thursday, 2/28: Harvard Book Store in Cambridge, MA (1256 Mass Ave.) at 7:00 pm. Friday, 3/1: MIT, Cambridge, MA (room to be announced) at noon. Great news: we finally have a venue in New York! I'll be at the Alpha One Community Hackerspace in Brooklyn (231 Norman Ave., #312) on Monday, March 5, at 7 pm. More events to follow. The complete book tour schedule can always be found at http://explodingthephone.com/tour.php. Wednesday, 2/13: Kepler's at Menlo Park (1010 El Camino Real) at 7:30 pm. Tuesday, 2/19: Powell's Books in Portland (1005 West Burnside) at 7:30 pm. Friday, 2/22: Village Books in Bellingham, WA (1200 11th St.) at 7 pm. Hope to see you at one or more of these events, with more to follow in the coming weeks. Exploding The Phone had a very good weekend! Howard Schneider at The Wall St. Journal reviewed it on Friday and describes it as an "authoritative, jaunty and enjoyable account of [the phone phreaks'] sometimes comical, sometimes impressive and sometimes disquieting misdeeds." Geeta Dayal at Slate also reviewed it over the weekend and connected the dots between phone phreaks and Aaron Swartz. Rebecca Onion, also at Slate, wrote a lovely pictoral piece on the history of the use of whistles in phone phreaking. Finally, just to round things out, both Amazon and Barnes and Noble listed Exploding The Phone on their books of the month lists for February! Exploding The Phone had a great weekend! First there were nice reviews in both the Wall St. Journal and Slate (with a bonus pictorial feature on whistles used in phone phreaking). And then both Amazon and Barnes and Noble picked it for their "best of February" lists. On Wednesday, 2/6 I'll be a guest on WBAI's "Off The Hook" program in New York City at 7 pm Eastern time. New Yawkers can listen on 99.5 FM. Everyone else, you can get streaming audio at http://www.2600.com/offthehook. Monday, 2/11: Skylight Books in Los Angeles (1818 North Vermont Ave.) at 7 pm.